Only 30 months Old... 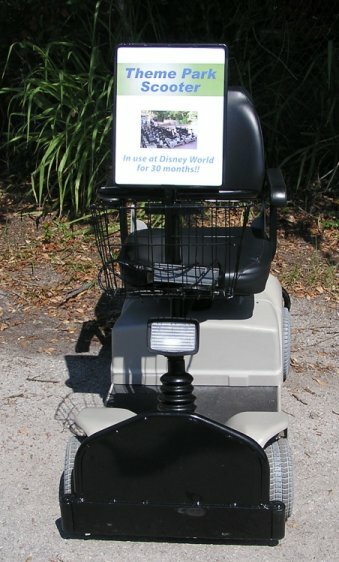 In excellent condition...Industrial Strength rental scooters from Disney world. On sale to the general public. An excellent value at only $995.00 each. Massive discount available for purchases of more than 10 units or more for commercial purposes. Heavy duty Industrial scooter with weight capacity of 450 lbs.!!!! Wheel Size Front - 8" solid, Rear - 10"
Top speed programmable from 3.2 or 4.7 mph. with large 10" solid rear tires and 8" solid front tires. 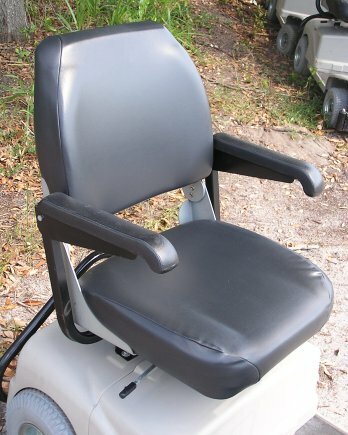 Comfortable high back 20" wide x 16" deep swivel contoured captains seat with flip-up arm rests. Seat Height adjustable from 18" to 20" high. 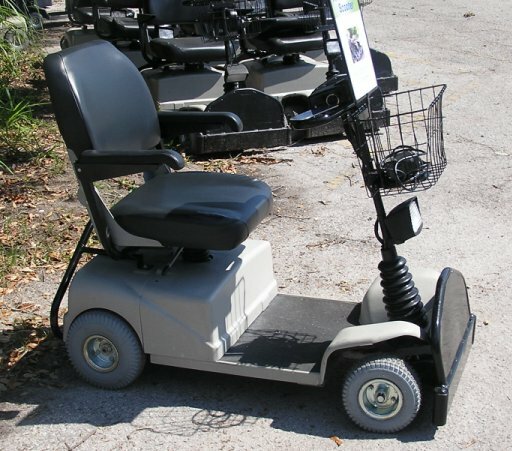 Extremely tight turning radius...great for indoor use in department stores, and rugged outdoor use. Double automatic safety braking system with protective safety bumper on front and rear for industrial use. Motor 400 watt, 4250 r.p.m. Seat High back contoured captains seat, 20" w x 16" vinyl, swivel, weather resistant, with height adjustments from 18", 19" and 20"
Easily accessible charger outlet. Powerful 7 a.h. off board charger. Battery size 12 v, 33 a.h. Fixed tiller and front basket standard. Maximum Speed 3.2 to 4.7 mph, variable speed control. Powerful 24v DC motor - 400watt x 4250rpm. Seat Height to floor: 22" to24"
Height to deck: 16" to 19"
Front and rear high mounted bumpers to protect against additional rider use. Plug Key with large contact plate. Delta Tiller for ease of use with finger tips or thumbs. Front headlight, comes on automatically when scooter is on. Heavy Duty Solo 4 Wheel Fleet Unit. Rugged outdoor use with 4" ground clearance and solid tires. Incredible turning radius for indoor use. Great option for malls or department store rentals. Deep discounts on purchases of 6 or more units. 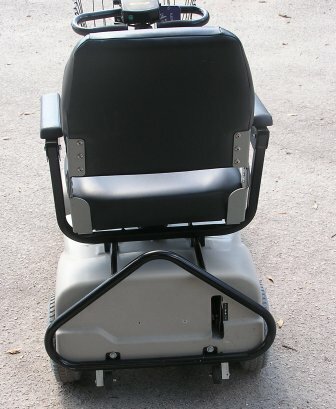 Many safety features such as front and rear safety bumpers forward and reverse switch, automatic back up beeper, automatic front headlight, swivel seat with flip-up arm-rests, standard front basket and electromagnetic brakes. These units are 30 months old with rugged MK batteries and are available with an optional rental warranty. The Solo Fleet unit is rated for rental purposes. For Fleet or individual purchases Please call 1-800-449-8991 for more info. Industrial Front and rear bumpers are designed so that no one can stand on the front or rear of the shroud. This eliminates cracks in the shroud and additional liability for commercial purposes. 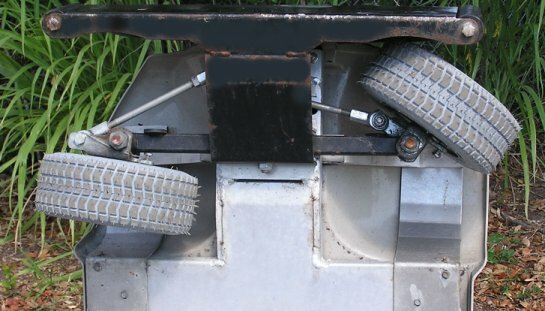 These bumpers are removable for personal use, but do offer an excellent brush guard for outdoor use. The rear bumper allows the owner to easily tip the unit up on it's end for easy storage. The extremely versatile Delta tiller is great for commercial purposes. 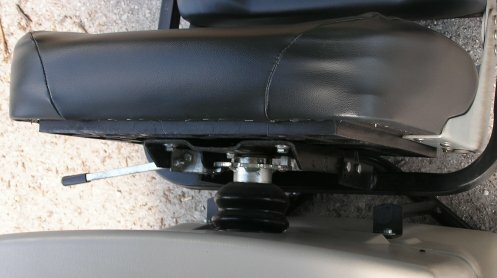 It allows the user to control the scooter with the thumbs or the finger tip. Finger tip control is especially useful for those with limited dexterity in the thumbs. 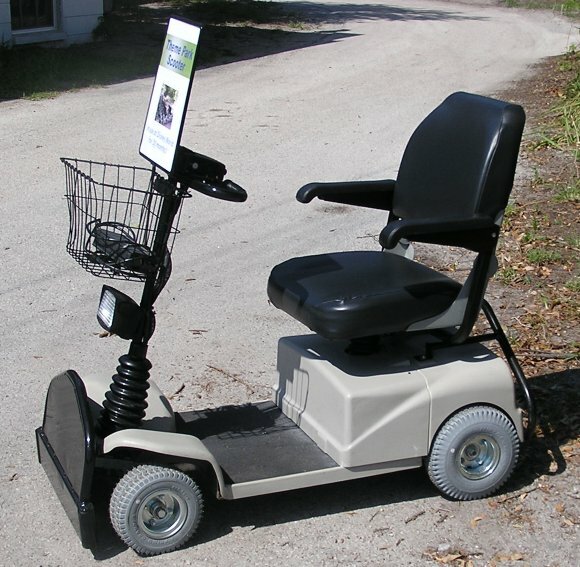 Because this scooter offers both options, this is an excellent scooter for rental purposes to allow the most options to your users. The Solo comes standard with variable speed control, forward and reverse switch and a plug key. The power gauge works like a gas gauge and indicates the need to charge the scooter. The Solo Fleet Unit The seat was designed with no center seams on the seat bottom or back, to prohibit the seepage of rain water into the protected foam cushion. 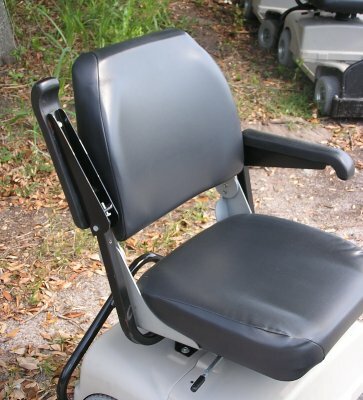 This is a contoured, padded, 20" wide by 16" deep swivel seat with flip-up arm rests designed to fit a wide variety of user up to 450 lbs. The seat height is also adjustable in height from 18" to 20" for taller users. The Solo Fleet Unit was designed to be almost completely weather resistant. This is ideal for theme park or any outdoor use. The seat was designed with no center seams on the seat bottom or back, to prohibit the seepage of rain water into the protected foam cushion. 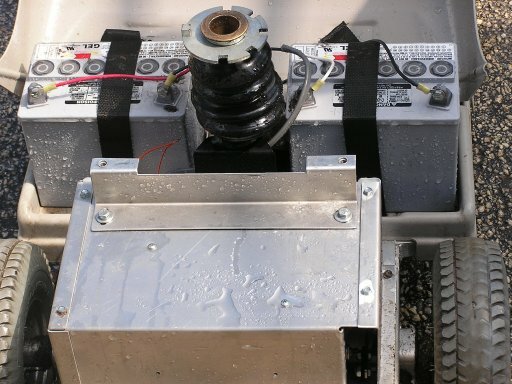 The motor control and the tiller control are sealed with silicone to prohibit any water damage. The undercarriage of the unit, and the transaxle are also sealed. The Solo Fleet Unit was designed with an custom front wheels that have an extreme turning radius unlike any other scooter on the market. This is what makes this scooter Ideal for indoor or outdoor use.